Ribs can seem like one of those foods beyond reach for a typical home chef. Turn on the Food Network, and you'll see shows & contests, featuring massive slabs of meat, stacked up into smokers the size of a large car, like Jenga pieces. The Pit Master, gets in front of the camera and discusses his blend of various hardwoods, and how he's been up since 5am getting the fire to exactly 200 degrees; and how he's never stepped more than 5 feet away so he can maintain the perfect smoke & temp. Admittedly, I'd be first in line to taste those ribs. But equally, I'd be last in line to sign up for the constant care & attention, and the shear time, that those guys put in. Yet, I still love me some baby back ribs, and I want to make them at home - the easy way. So, all we do, is come up with an easy to do "home version", that is admittedly, not QUITE as good as the pro's, but will still fully satisfy. My version of ribs is still insanely tasty, takes about 1 hour of active time, and about 2.5 hours of cooking time, and is simple enough that anyone can make them. Check out the steps below, and let me know what you think by puting your tips in the comments! Remove the ribs from the oven. At this point (as I do in the video), you can put the ribs in the fridge, and finish them the next day. Or if eating right away, I like to let them rest/cook for about an hour; they become easier to handle and to char on the grill. As the ribs rest you can drain off the fat/liquid that has come off; and remove the fat. The remaining broth can be reduced down or added to a BBQ sauce for extra flavor. 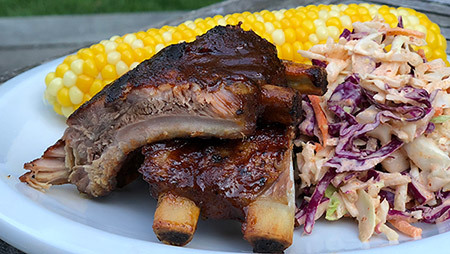 I like to finish the ribs on the grill; so while the ribs rest, turn it on medium heat; you can do the same in the broiler, if you don't have a grill available. Turn the ribs over, and coat the other side with sauce. Once complete you're ready to serve. You can put whole slabs on plate, of cut them up into individual/double cut ribs.